Barred owls, photographed at Loxahatchee National Wildlife Refuge, Boynton Beach, Palm Beach County, in March 2017. The barred owl, Strix varia, is a bird with a question on his mind, a question he asks with a bit of a drawl. "Who Cooks For You ... Who Cooks For You All." 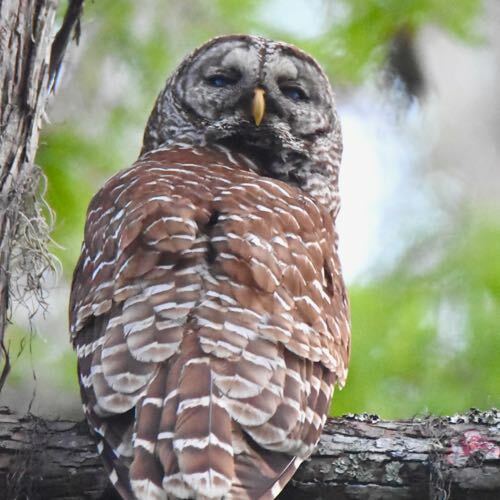 If you're anywhere near a barred owl, you will hear that cry, assuming said owl is awake. Barred owls can be very, very loud and just as distinctive when announcing their presence or calling out to a mate. 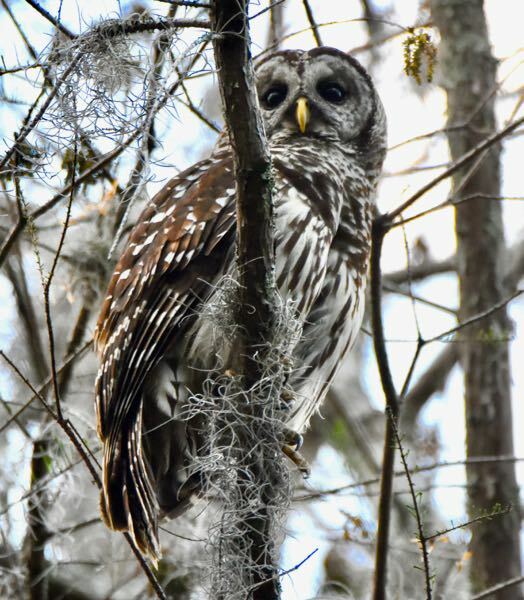 In fact, your chances of hearing a barred owl are much greater than catching a glimpse of one. And once you hear it, you know instantly what it is. Barred owls are common birds but they tend to hang in large forests, usually near bodies of water. Like most owls, they are nocturnal creatures, and that adds to the difficulty in spotting them. 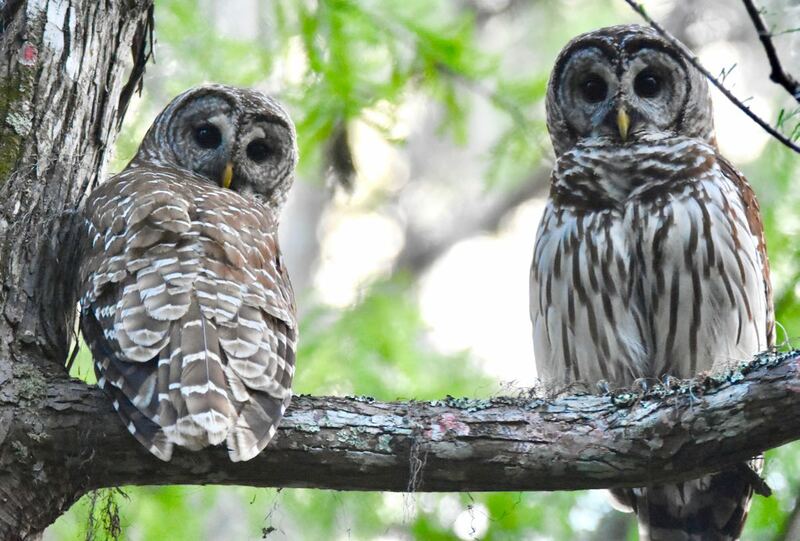 However, barred owls are more likely to be active during the day than their cousins but the most likely times to see them are early morning and late evening. They are found throughout Florida; their range covers most of the eastern United States into Canada, across the Canadian plains and Rockies into the Pacific Northwest south to Oregon. There's also a population in Mexico. They are closely related to the spotted owl, and where their ranges overlap they do hybridize. They are resident birds throughout their range. Barred owls are stocky birds, 20 inches head to tail, and with a wingspan just short of four feet. They are somewhat smaller than their nemesis, the great horned owl, but much larger than the eastern screech-owl, the two other owls commonly found in South Florida's forests. They lack the horn-like tufts of feathers that distinguish the great horned, and their eyes are dark, unlike other owls, and somewhat sunken in appearance by large, gray facial "disks." Their undersides are vertial striations of browns and whites, the backs a mottled mix. Other than their loud calls, barred owls move about the forest like ninjas, totally silent in flight. They will sit on a branch and scan the forest floor, mostly at night, waiting for a tasty meal to come their way, be it squirrel, rabbit, mouse, bird, reptile, amphibian or bug. They'll swoop down to take a fish or wade out if necessary. Their diet, however, is influenced mostly by what's available. In Maryland, they eat a lot of small mammals; in Louisiana, a lot of crayfish. On the flip side, barred owls, their eggs and young are often the victims of the great horned owl. They are territorial birds, and will call out to establish and defend their turf. Males will stake a claim, then find a lady of the species with which to mate — most likely for life. They nest in tree cavities — the tree has to have a diameter of at least 20 inches — or an abandoned platform nest of another species. It's not known whether the male or female picks the site, but in any case it is picked with a degree of care — the pair might scout around for a year before setting down roots so to speak. Nesting season can begin as early as January or as late as March. The female usually will lay a clutch of two to four eggs, which will require about four weeks of incubation, all of which is done by mom. The offspring will remain in the nest for about five weeks; by six weeks, they're fully fledged. Barred owls are members of Strigidae, the family of true owls.